A former President Barack Obama-backed group that is focused on state elections with redistricting repercussions has pushed an additional $250,000 into Virginia's gubernatorial race to back the Democratic candidate, records show. The National Democratic Redistricting Foundation—a foundation associated with the National Democratic Redistricting Committee (NDRC), a Washington, D.C.-based organization focused on redistricting efforts chaired by former Attorney General Eric Holder—donated $250,000 to the Virginia Democratic Party on October 11, Virginia campaign finance filings show. The donation came the same day it was reported that Obama would hit the campaign trail for the first time since leaving the White House. Obama will attend a rally next week in Richmond, Va. on behalf of Ralph Northam, the Democratic nominee for governor running against Republican Ed Gillespie in the November 7 election. This is the second donation from the Obama-backed group supporting Northam's candidacy. 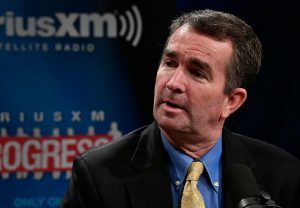 The NDRC gave a $500,000 donation to the Virginia Democratic Party in late August, which appears to be the first political contribution from the group. The NDRC is the "first-ever strategic hub for a comprehensive redistricting strategy," its website states. "With the support of former President Barack Obama, as well as key leaders around the country, the NDRC is attacking this problem from every angle to ensure the next round of redistricting is fair and that maps reflect the will of the voters," it continues. "Together, we will rebuild a democracy where voters pick their politicians—not the other way around." The group seeks to use a four-part strategy that includes "advancing legal action, mobilizing grassroots energy, supporting reforms, and winning targeted elections." Before departing from the White House, Obama held a strategy meeting with Sen. Chuck Schumer (D., N.Y.), Virginia Gov. Terry McAuliffe, and Rep. Nancy Pelosi (D., Cali.). The group identified breaking up Republican controlled areas as a major objective for the Democratic Party. Holder told the New York Times last year that Obama resented how House Republicans impaired his legislative agenda for a portion of his presidency. "The tasks that he had placed before him were made a lot more difficult, progress a lot more difficult, than it needed to be," said Holder. "That's because of the Congress that he had to deal with, which was a function of the 2010 redistricting effort." Obama's first political event since leaving office was a NDRC fundraiser this past summer that Holder and Pelosi attended. McAuliffe has also helped the group fundraise, which hauled in nearly $11 million during the first half of the year. In addition to Holder, the group is comprised of former and current heads of other liberal committees and organizations, information that was once readily available on its website but now appears to have been removed. Kelly Ward, the former executive director of the Democratic Congressional Campaign Committee (DCCC), is the executive director of the NDRC. Elisabeth Pearson, the executive director of the Democratic Governors Association (DGA); Jessica Post, the executive director of the Democratic Legislative Campaign Committee; Ali Lapp, the president of the House Majority PAC, a super PAC backed by Pelosi; and Greg Speed, president of America Votes Action Fund, the self-described "coordination hub of progressive community" that focuses on voter turnout, all sit on the NDRC's board of directors. Marc Elias, a partner at the D.C.-based Perkins Coie law firm who acted as Hillary Clinton's top campaign lawyer, acts as senior advisor and general counsel for the group. The NDRC did not return a request for comment on its donations by press time.